Getting out and getting a little dirty is part of the fun of camping until you have had enough. 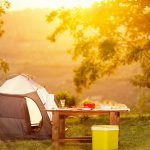 Unless you have a ready supply of water from a natural source or a part of the camping ground you are staying in, it really pays to plan ahead and know a few hacks to staying clean when you are in the great outdoors. 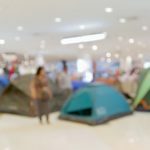 These tips are designed for those who are really getting out there and not staying at a camping ground. Hand sanitizer is just as useful in the great outdoors as it is at the airport or around the city. Remember that hand sanitizer is not for when your hands look dirty. It is for keeping your hands clean of germs. It is great for using after going to the toilet and perfect for when you are about to prepare food. Germs exist in the outdoors just as much as they do around the home. Sanitizer is perfect for camping. Wet wipes replace soap and water when they are not available and is particularly useful when you are on the move. It is not just for kids. You will be amazed at how many times you will be reaching for wet wipes. Wet wipes are great when you don’t have any water source and you have a day out in the sun and you want to go to sleep without smelling like a bag of football socks. Cotton clothing is simply the best for reducing body odour. Cotton clothing breathes better than anything else. Polyester clothing is perfect for bacteria. They just love to grow in polyester. 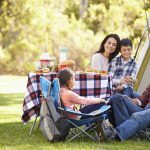 Cotton is perfect for camping trips in the warmer months but remember it stays wet for longer and might not be the best choice if you are camping in the cold. The simple rule for clothing is natural fibres. They always perform the best and that goes for wool. Wool is not hot in summer and stays cool in summer. Wool may cost you a little more but will be worth it in the long run. Whether you wash in a river, lake or in the ocean, you will still want to wash yourself with soap afterwards. You can pick up bacteria from natural sources and you will be covered in salt when you wash in the ocean. It is important you don’t pollute the environment while you clean yourself. You can always heat up some water to sponge yourself down afterwards and make sure you keep pollutants (soap, gel and shampoo) away a good few hundred metres away from the water source. Portable camping showers are always a luxury when you are camping. It only takes a few days in the outback to really appreciate the joy of a warm shower with fresh water. 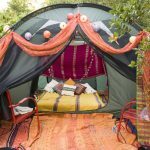 Numerous camping showers are available on the market. 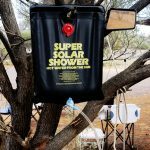 Solar showers are the most affordable and essentially a black bladder that absorbs the heat from the sun. When it comes to staying clean, your hands and face are the most important. Even if you don’t have enough water to wash everywhere you want to, always make sure you keep your hands and face clean with wet wipes and sanitizer. 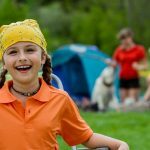 Do you have your own hacks and tips on camping gear to staying clean when you are camping? Share them with us.